On Friday, January 18, 2019, a number of Trinity students participated in the annual March For Life in Washington D.C., protesting the practice and legality of abortion. Though it’s been almost 45 years since the Supreme Court case of Roe v. Wade, enthusiasm over the cause could not have been stronger. The day started out with Mass in the Trinity chapel before the students embarked on their journey to rally with thousands of other anti-abortion activists. 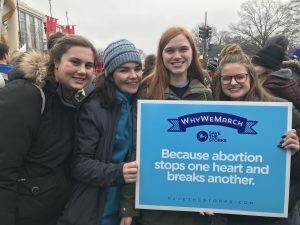 The Trinity students marched toward the United States Capitol building waving signs that read creative sayings such as “Love Life, Choose Life” and “I Love Storks!” They joined the vast number of younger participants, who carried signs that read “I am the Pro-Life Generation”. The chants and posters were all driven by one thing that existed in the hearts and minds of everyone attending: standing up for those who couldn’t stand up for themselves. The voices of the unborn were heard through those marching, and with over 100,000 people at the March for Life, including Trinity’s students, their cries were loud. Trinity provides a bus each year to attend the March for Life, which in turn gives the students an experience like no other. After attending the March for two years through Trinity, Caroline Dash ‘20 (De La Salle House) said of her experience, “I think it was a great opportunity to stand up for what I believe in, and it was inspiring to see how many people were there.” Maureen Pham ‘20 (De La Salle House) said, “I would describe my experience as very positive. I find that it is distressingly easy to feel isolated in my faith and beliefs, especially with the passage of the new late-term abortion laws in New York. The huge number of people who were at the March for Life testified that my faith is not an individualistic experience. Life is a miracle, and being in the presence of so many other people who stand for its fundamental value was greatly reassuring and moving.” Trinity’s trip to the March for Life could not have been successful without Mr. Root organizing the event and Father Sahd accompanying the students throughout the day. Also, Trinity offers a Respect Life Club for those wishing to continue carrying out the pro-life cause.